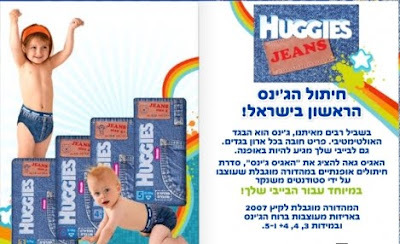 Three years ago Huggies Israel launched a limited edition line of denim inspired diapers. The company recently debuted it's product line in North America with a commercial that's sparked conversation. Is a diaper meant to be a functional item only or should it also serve as a fashion statement? The ad airing on network television has sparked controversy for the use of the word "pooping" which was changed to "When you gotta go, go in style." to please some network executives. When it comes to the diaper industry, they are not immune from the ups and downs of sales. Even though diapers are a necessity for parents, it is a staple item that could easily be made into a fashion item. What better way to look fashionable running around in a diaper? Any baby can emulate his/her mom in jeans. But since these babies have no clue what they are wearing it's really about the parent wanting them to look fashionable. Check out the commercial below which started airing May 31, 2010 in the USA and Canada.